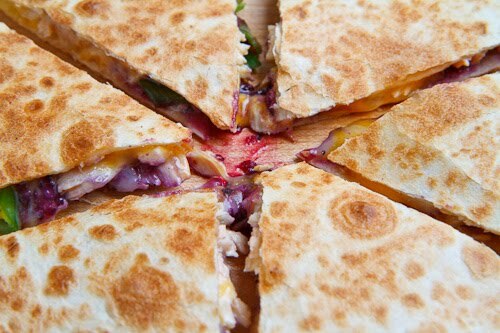 Salmon bulgogi quesadillas with blueberry salsa and plenty of ooey gooey melted cheese. When I make tacos I tend to keep them on the lighter and healthier side but invariably while I am going over the recipe, I start thinking about loading up on cheeses and sour cream, etc. Luckily there is an easy solution to get the best of both worlds and that is to make sure that there is enough left over from the tacos to use to make some quesadillas! 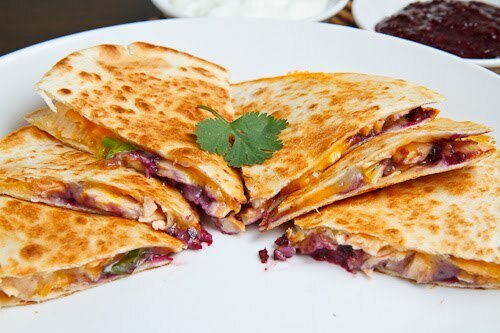 At their base, quesadillas are made from two layers of tortillas that are filled with cheese and toasted until the tortillas are golden brown and the cheese melts and gets all nice and ooey and gooey. Even in this simple form they are hard to resist but you can also add things like meats, salsas, herbs, etc. 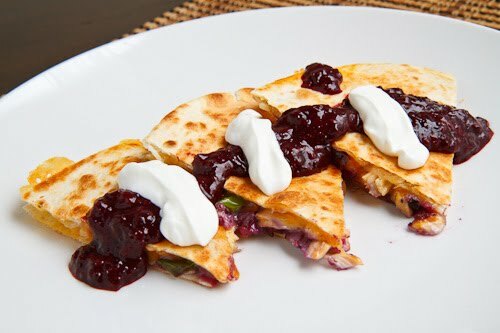 Pretty much any meat that can be used in tacos will go well in quesadillas and I was looking forward to using the leftover salmon bulgogi from the salmon bulgogi tacos with blueberry salsa in cheesy quesadillas! In addition to the salmon and the cheese I added some of the blueberry habanero salsa to the quesadillas for some heat and some onion and cilantro relish to freshen things up a bit. Sprinkle on half of the cheese onto the tortilla followed by the salmon bulgogi, onion and cilantro relish and blueberry habanero salsa followed by the remaining cheese and top it all off with the second tortilla. This looks so good with the blueberry salsa! Enjoy that fact that it's got salmon in it too. Kevin, I have to share something with you. Almost every recipe you post is one I would love to cook and eat. I really mean it. 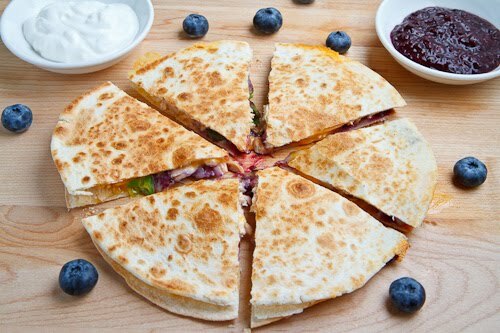 This Quesadilla is no exception. Why do you live so far away? You could be my neighbor and we could plan our dinners together. Think about it! Colorado is really pretty. what we call quesadillas are ONE tortilla fold with cheese or other fillings like zuchini flower or huitlcoche (a fungus of the corn), usually the quesadillas are prepare with freshly hand made tortillas or with dough filled like a turnover and then deeply fried in oil. Mouthwatering! A flavor combo that is so unique. Between the tacos and the quesadillas, I don't know which I want to make first! Anonymous: Please do! I am always looking for good, authentic Mexican recipes. Ellie: Gochujang is a Korean chili paste that adds a nice flavour and some heat to the bulgogi marinade. You should be able to find it in a local Asian grocery store and you can order it online from places like Amazon. If you cannot find it though you could easily skip it as the blueberry habanero salsa will add plenty of heat. I will, I promise, I just have to take the time to translate, I was thinking about the mole, my mother has my gran's recipe, but maybe the ingredients and the process of blending could be a problem, anyway is always interesant read exotic recipes. But if you have a request, please ask. Hey dummy, that's a frittata, not an omelet.